My Notting Hill: Black Walls - would you dare? Black Walls - would you dare? 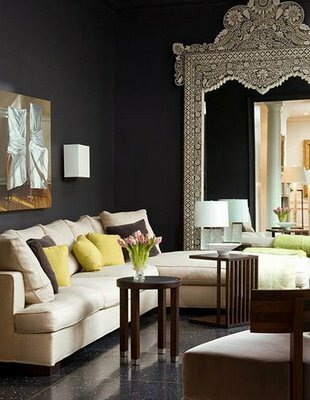 Black walls - would you dare to? What would it take - tall ceilings, tons of light, or just incredible confidence? If you would, what room - library, powder room, home theater, bedroom? Yes, no, maybe? Check out the survey - I'm curious. 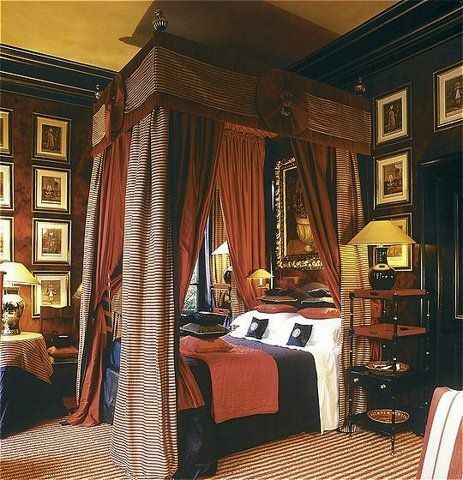 This bedroom, designed by Kelley Proxmire, was in the Spring 2007 Washington Design Center showhouse. I remember it well - it was simply stunning! 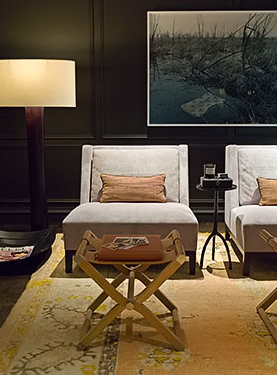 The following images are from the Blakes Hotel in London, interior design by Anouska Hempel. We stayed there in July 2005. Interestingly enough, both rooms we stayed in at the hotel featured black walls. We stayed in this room the last night. You couldn't help but feel a bit regal in it. This room was my favorite of the two - partly because of this gorgeous Biedermeier bathroom. Designer Kara Mann, image via Turquoise Chic. 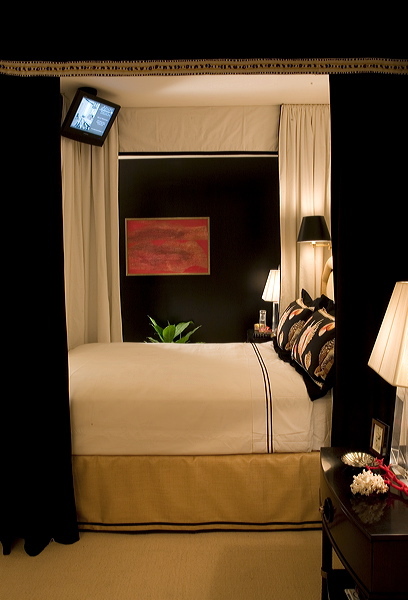 Go to Kara Mann's site and click on Lake Shore Drive Penthouse to see more beautiful rooms featuring black walls. hmm for me it would take alot of natural light......just like this last photo but especially like the doorway with the photo frames...that looks spectaular....I do have a dark wall in my lounge but it's a grey brown...I just prefer a warmer feeling. yes, I would. Halloween parties would be much more fun. Every designer or artist needs one black room, right? I BEGGED (then Threatened to paint it myself without permission ) my friend to paint an upstairs room of her store black. It had lots of windows and light. My thinking was that all merchandise would pop of the walls. No go, she went with a yellow...sorry but boring and safe! Oh the pics are so beautiful. I don't know if I have the guts. It all depends on how big my house was. If I had the space to really play with them maybe I would. This sure makes me want to. I would do it if I thought I could get it right. I'm not a great painter, so tend to stick with colors that don't look so bad when splotched a bit on the trim and ceiling - or aren't hard to cover over with white paint to correct. If I get better at it - I can think of a bathroom which I'd love to do in black paint. I love black walls! I knew a guy who had a room w/ black walls about ten years ago, and they looked great! But, I must admit that I have never tried it myself. I like them but I think they tend to feel cold. I had a deep deep navy blue bedroom a few years ago and it was really lovely. I have always wanted to. Just havent found the right room for it. love the look... not sure I would do it... maybe... I do like daring walls... so I can't say no. I painted my dining room walls black several years ago and I still LOVE it! 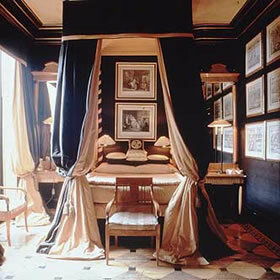 Each adjoining room is enhanced by the amazing contrast. I'm an interior redesigner and would love to recommend it to a client -- just looking for the right person. What a BRILLIANT post. My bathroom is painted black although I had really wanted to do a room in black and I had mutiny on my hands. Next time around ^_^ Such inspiration. 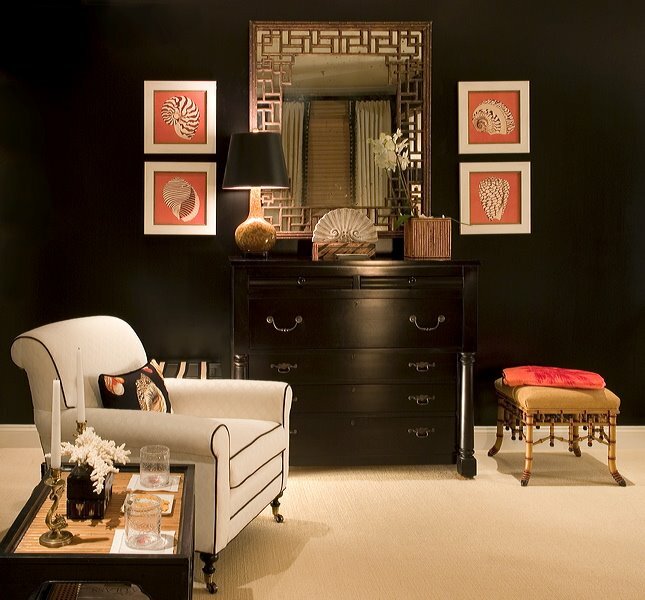 With black walls, it's all in how you pair the rest of the room with it (floors, fabrics, furnishings.) LoVE this post! Great inspriation! not sure I would dare, but these photos are DIVINE! Yes, yes, yes! I have all white furniture in my living room but unfortunately my windows face north so there isn't enough natural light to do black walls successfully. Instead I did a dark orange/terra cotta and it looks great and warm but not 100% of the drama I was shooting for, more like 75%. 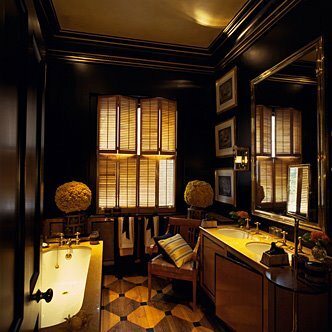 My half bath is dark chocolate brown with white trim and I adore it, I want to do my whole bedroom that color. With white linens wouldn't it be like being enveloped in a cappuccino? Hmm, given the right space, I think I would dare. I definitely like light and airy. In fact, I am having my bedroom painted right now, and it is a very light color! However, I do remember going to a friend's house when I was 8, and simply loving the black bathroom. It seemed like such a secret, quiet little room, exactly the right mood for a bathroom. I would dare! That looks gorgeous! I was going to say "no, not for me" but after looking through all of these wonderful pictures I am having a change of heart! Thanks for visiting my blog - so excited to have found yours! Absolutely! I did a post about black a little while back (http://www.studioannetta.com/2008/01/back-in-black.html) - but it's so nice to see so many other images that I hadn't found. Of course, I've since seen a few more. I think it takes a bit of courage, but it would look amazing in the right room. Kelly is a real talent. And a nice lady to boot. I'll make sure she sees your nice post. I also did a quick little post on thisas well after seeing a gorgeous dining room painted black. I absolutely love the idea of it, but do think you need the right amount of light to make it work, as well as making sure the black ties into colors in adjoining rooms so it doesn;t look like a random black box. 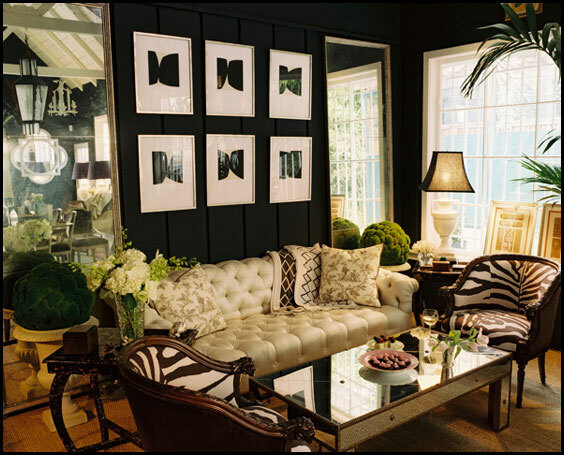 just found your blog and this post on one of my favorite things, black walls!! I've loved them ever since a friend got some floral Sanderson wallpaper on a black background in her bedroom back in the early eighties.So dramatic. I've just printed some wallpaper with gloss back ink on matt black paper, it looks fab! I don't know if I'd dare but I do love these beautiful pics! I linked them up to my "black walls" post too, come on over and check it out!